Welcome to the Hexham & Tynesdale branch! We are a group of local volunteers offering support, information and friendship to parents and parents-to-be. Our next Nearly New Sale will be on Saturday 6th April, 2pm - 3.30pm (early entry at 1.45pm with valid NCT Membership card). Please visit our Nearly New Sale page (link on right) for further information on how to book a Sellers or Trade Table. With many thanks to our new volunteer Andrea, Babes in Arms will continue throughout the spring and will be supported by local breast feeding support volunteers. This is a fun social event held on the first and third Wednesday of every month, from 10 am until 12 noon, aimed at parents and babies up to crawling age, although there is also a toddler play area at Wheelbirks. Drop in and join us for coffee, cakes and ice cream and to meet other parents with babes in arms. There's something about Wheelbirks ice cream that takes the edge off that sleep deprived feeling! Please visit our Babes In Arms page (link on right) for further information and keep checking our facebook page for future dates and uptodate announcements https://www.facebook.com/NCTHexhamTynedale/. Unfortunately, due to limited volunteers, we've had to cancel the bumps, babies and toddlers group. If you think you would be able to spare some time once a month to keep the group going, or have suggestions on other groups, please get in touch - we'd love to hear from you and would appreciate any support you can offer. Please visit our Bumbs Babies and Toddlers page (link on right) for further information and keep checking our facebook page for future dates and up-to-date announcements https://www.facebook.com/NCTHexhamTynedale/. As all of our local events and activities are run and organised by volunteers, we are always on the look out for new volunteers to join our team. 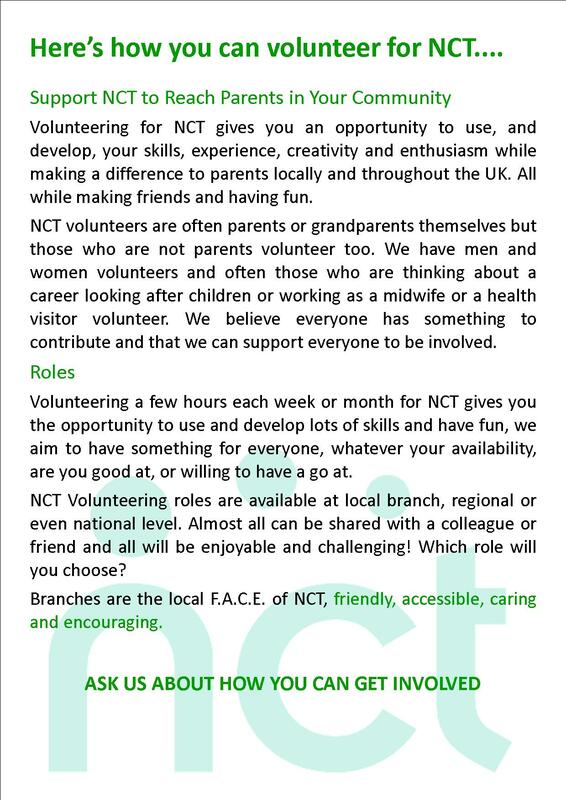 Please contact us on Branch.HexhamAndTynedale@nct.org.uk or via Facebook if you would like any further information or have any questions. Our last Branch meeting was held on 6th June 2018. Please visit our Branch Meeting page (link on right) for further information and keep checking our facebook page for future dates and uptodate announcements https://www.facebook.com/NCTHexhamTynedale/. We recently started a new group, Bump Club, to enable expectant parents, whether it be your first time or not, to meet other 'bumps'. Everyone welcome, no need to be a member. There is no charge for this event, but refreshments will be available to purchase from the venue. Please visit our Bump Club page (link on right) for further information and keep checking our facebook page for future dates and uptodate announcements https://www.facebook.com/NCTHexhamTynedale/. Please let us know if you are interested in this. We are sorry to say that the sling library is currently suspended while we find a new volunteer to relaunch the library in line with the new guidelines. Please get in touch if this is something you feel you could volunteer to do for our local community. If you are looking for sling information and hire, please get in touch for details of local sling libraries. This friendly social group is for parents and carers of young babies. It meets twice monthly on the first and third Wednesdays at Wheelbirks Ice cream parlour. Join us for drinks, cake and - of course - ice cream! We are still running regular local antenatal courses, please visit our Antenatal page (link on the right) for further details. Your opportunity to find out more about what we do and get involved. These are held regularly, please visit our Branch Meeting page (link on right) for further details. Interested in getting involved? Please contact us using the details at the bottom of this page. We'd love to hear from you! To find out a bit more about who NCT are and what we do please click here.